Virtual Desktops in Windows using VirtuaWin | The adventures of a developer! I’ve used for the first time today VirtuaWin under Win 7 64-bit and I’m happy to say that it worked well! I downloaded the executable setup from the website, I run it and a small tray icon appeared. 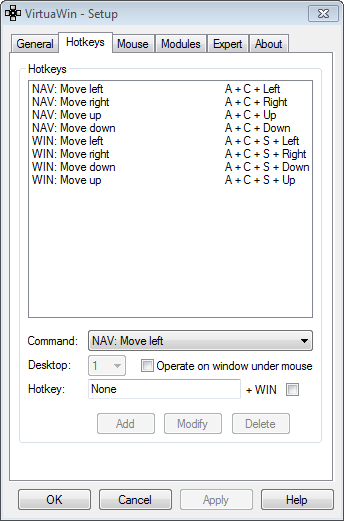 I couldn’t figure out how to move a window from one desktop to another but then I opened the setup page and I saw the hotkeys. I modified them (as shown on the screenshot below) and now I have my desktops & shortcuts like in Linux (Ctrl + Alt + <arrow> switches to other desktops and Ctrl + Alt + Shift + <arrow> moves windows to other desktops).